8bit Sample reduction (low-resolution) mode External clock input and output The cards and digitizerNETBOXes of the 44xx series allow to op- Using a dedicated connector a sampling clock can be fed in from tionally reduce the resolution of the A/D samples from their native an external system. 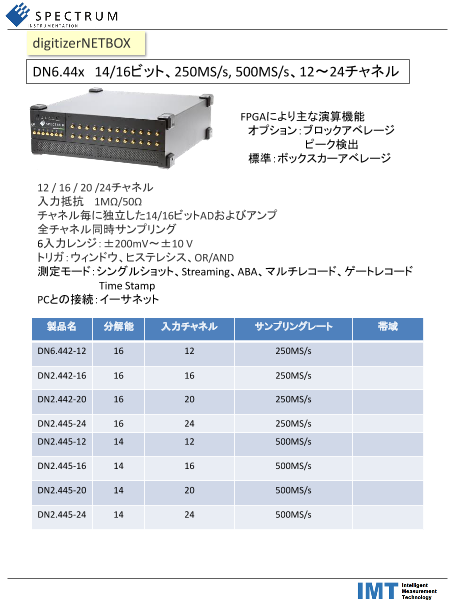 Additionally it’s also possible to output the in- 14 bit or 16 bit down to 8bit resolution, such that each sample will ternally used sampling clock on a separate connector to synchro- only occupy one byte in memory instead of the standard two bytes nize external equipment to this clock. required. This does not only enhance the size of the on-board mem- ory from 2 GSamples to effectively 4 Gsamples, but also reduces Reference clock the required bandwidth over the PCIe bus and also to the storage The option to use a precise devices, such as SSD or HDD. external reference clock (normally 10 MHz) is nec- Firmware Option Block Average essary to synchronize the The Block Average Module im- instrument for high-quality proves the fidelity of noisy re- measurements with external equipment (like a signal source). It’s petitive signals. Multiple also possible to enhance the quality of the sampling clock in this repetitive acquisitions with way. The driver automatically generates the requested sampling very small dead-time are accu- clock from the fed in reference clock. mulated and averaged. Ran- dom noise is reduced by the averaging process improving Export Versions the visibility of the repetitive signal. The complete averaging pro- cess is done inside the FPGA of the digitizer generating no CPU Special export versions of the products are available that do not fall load at all. The amount of data is greatly decreased as well as the under export control. Products fall under export control if their spec- needed transfer bandwidth is heavily reduced. ification exceeds certain sampling rates at a given A/D resolution and if the product is shipped into a country where no general ex- Please see separate data sheet for details on the firmware option. port authorization is in place. The export versions of the products have a sampling rate limitation Firmware Option Block Statistics (Peak Detect) matching the export control list. An upgrade to the faster version is The Block Statistics and Peak not possible. The sampling rate limitation is in place for both inter- Detect Module implements a nal and external clock. widely used data analysis and reduction technology in hard- ware. Each block is scanned for minimum and maximum peak and a summary includ- ing minimum, maximum, aver- age, timestamps and position information is stored in memory. The complete averaging process is done inside the FPGA of the digitiz- er generating no CPU load at all. The amount of data is greatly de- creased as well as the needed transfer bandwidth is heavily reduced. Please see separate data sheet for details on the firmware option. Option Embedded Server The option turns the digitizer- NETBOX/generatorNETBOX in a powerful PC that allows to run own programs on a small and remote data acquisition system. The digitizerNET- BOX/generatorNETBOX is en- hanced by more memory, a powerful CPU, a freely accessable internal SSD and a remote software development access method. The digitizerNETBOX/generatorNETBOX can either run connected to LAN or it can run totally independent, storing data to the internal SSD. The original digitizerNETBOX/generatorNETBOX remote in- strument functionality is still 100% available. Running the embed- ded server option it is possible to pre-calculate results based on the acquired data, store acquisitions locally and to transfer just the re- quired data or results parts in a client-server based software struc- ture. A different example for the digitizerNETBOX/generatorNETBOX embedded server is surveil- lance/logger application which can run totally independent for days and send notification emails only over LAN or offloads stored data as soon as it’s connected again. Access to the embedded server is done through a standard text based Linux shell based on the ssh secure shell.